Situated at the crossroads of three beautiful rivers, the city of Reedsport, Oregon offers a wealth of wildlife and natural beauty to its residents. Approximately 195 miles south of Portland, Reedsport sits on the much heralded Oregon Coast in the “heart of the Oregon Dunes.” Home to an estimated 4,200 residents, this city maintains a small-town feel, while also providing a variety of amenities and modern conveniences. Established on the estuary of the Umpqua River in the 1850s, Reedsport has developed steadily over the years, and has experienced a surge in tourism over the past two decades due to its prime location. There are a variety of affordable real estate options in this city, with prices ranging from just $14,500 to $445,000, and styles ranging from condos to spacious single-family homes. The great size of Reedsport makes it perfect for families and couples searching for a sense of community, as well as homebuyers looking for a getaway far from the bustling cities. The close proximity of this community to the Oregon Dunes National Recreation Area, as well as numerous beaches, lakes and rivers, allows residents to enjoy a wide variety of recreational pursuits. The nearby rivers offer a plentiful supply of great fishing spots, and the surrounding area is also perfect for long hikes and walks. Although the hallmark of this community is its beautiful natural landscapes, its location also means that shopping and cultural centers are close at hand, making it an all around great place to buy a home. 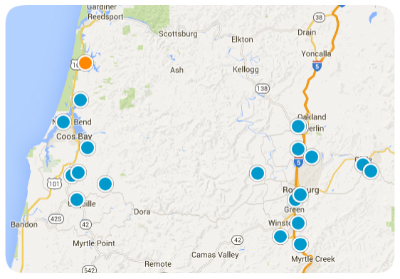 For more information about buying a home in Reedsport, Oregon, please don’t hesitate to contact us today!